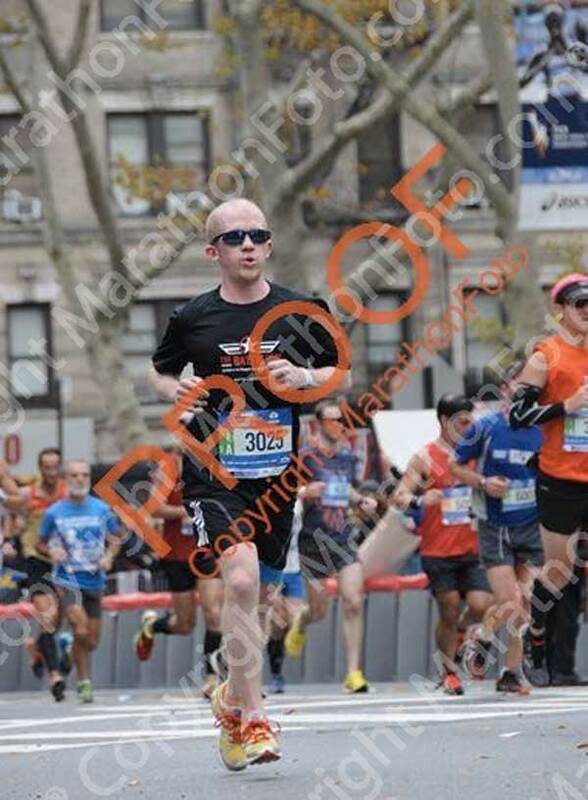 I don’t really know what kind of logic was pulsing through my brain when I signed up to run the New York City Marathon 3 weeks after Ironman Louisville. I was trained for an Ironman, but not for a marathon. “Baker, I am confused. 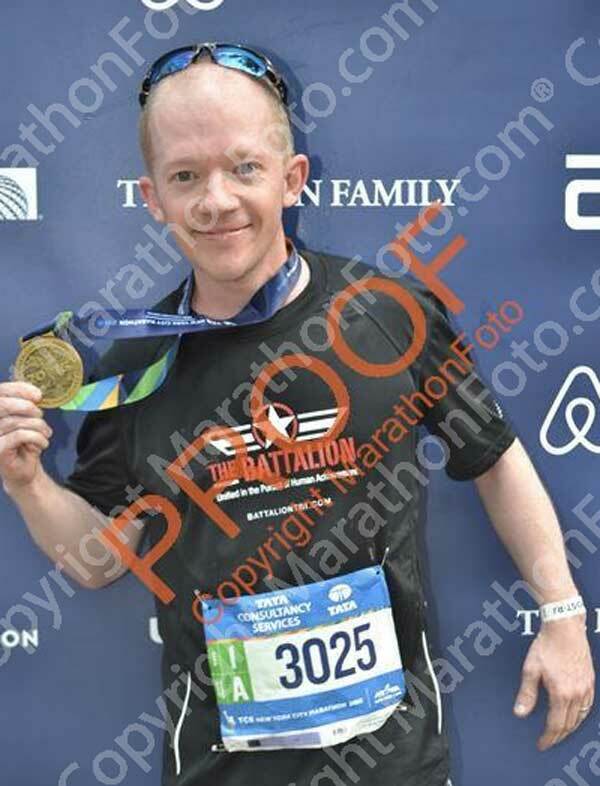 Don’t you run a marathon in an Ironman?” Correct. 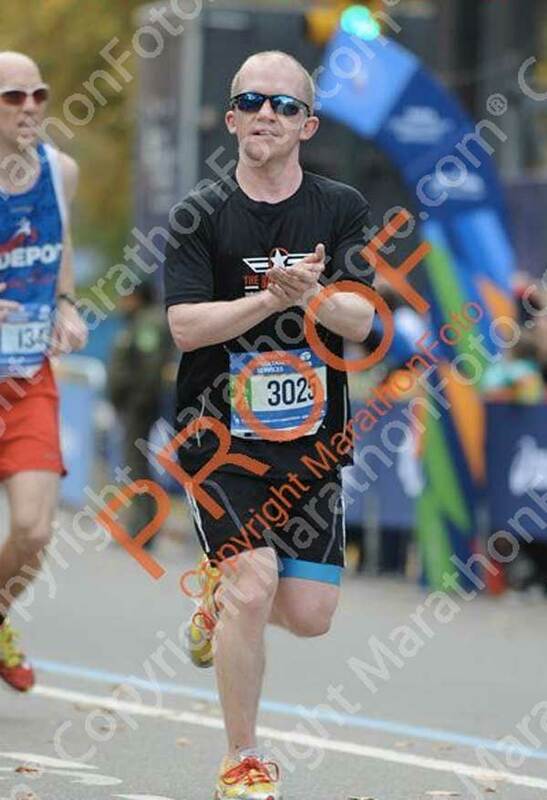 I was trained for an Ironman marathon, slow and steady. 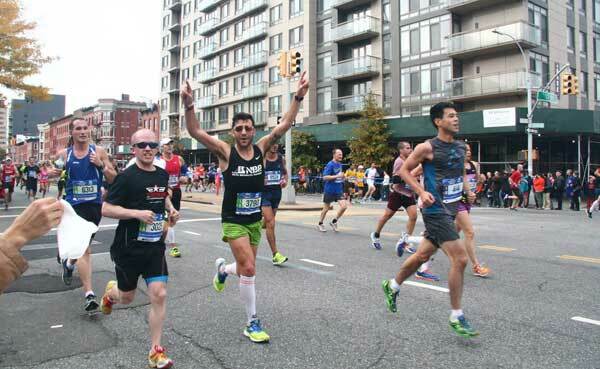 My legs had not hit my preferred running speeds for months, so I had no idea what to expect. I was just going to run this race for fun and enjoy my town, my friends, and the epic block party it throws. Our friends Katie and Jordan were in town along with Abbe’s parents Dave and Linda. The days leading up to the race were filled with fun food related events! The night before the race we chose to eat at Felice 83, a spot Abbe and I love. We got an extra hour of sleep and it felt so good! Abbe, Katie, Dougie and I caught a cab and headed to 79th and 1st. There, we picked up Jeff (my brother) and Jim (from Dad Posse) and broke into two cabs, barreling down the FDR enroute to the ferry. I ran (ha) into Meghan and Stephanie in the massive crowds waiting to board the ship. The ferry to the bus to the staging grounds was executed flawlessly. Jeff and I said goodbye to our friends as they were in the Blue Corrals and we were in Green. The waiting around that occurs before the NYCM was not terrible at all this year as the weather was great. It was 60 degrees… so maybe not so great for running as that is pushing the hot threshold. I jumped into the front corral and said goodbye to Jeff who was only 3 corrals back from me. Surprisingly, in a massive international field, I was able to find a friend. My pal Evan was chilling out in the same corral! As we waited to enter we saw a bunch of the GCR crew rollin as well. I also ran into Patricia and then finally my buddy Rowland. Such a small world this running community is! The cannon went off and then, with much applause, we started our run. With no watch and no goal other than to ‘have fun’ my race was relaxed. Evan decided to hang with me and we pretty much hammed it up for the first half of the race. We were singing songs to each other and yelling things like “Don’t you ever leave me!” when we lost each other at aid stations. I am going to try and name off everyone who yelled my name cheering. If I missed you feel free to chime in, it was a blur out there! Betsy was up first, screaming at us like a pro! 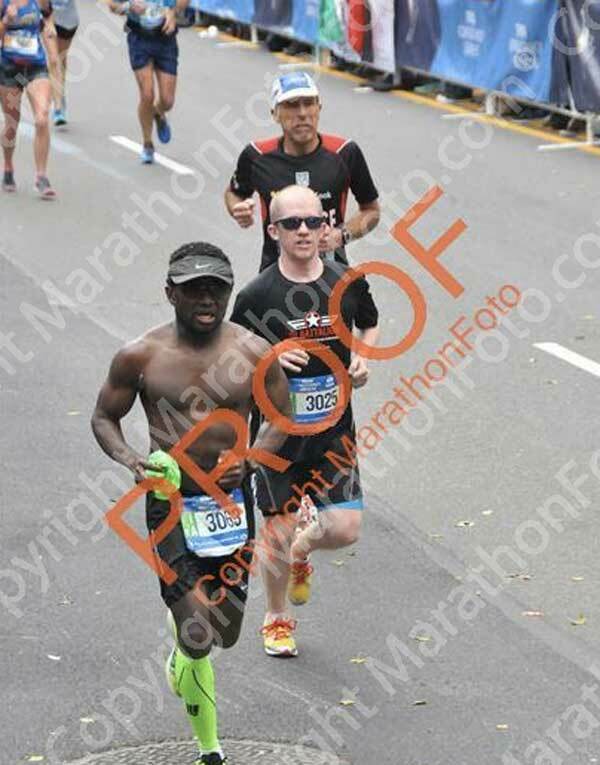 Then we saw Sam who caught some great pics of Evan and I. Noah was somewhere around Mile 6 I think. The bands were amazing this year! I was really digging the tunes an jamming out when I could. My legs felt good but not fresh by any means. 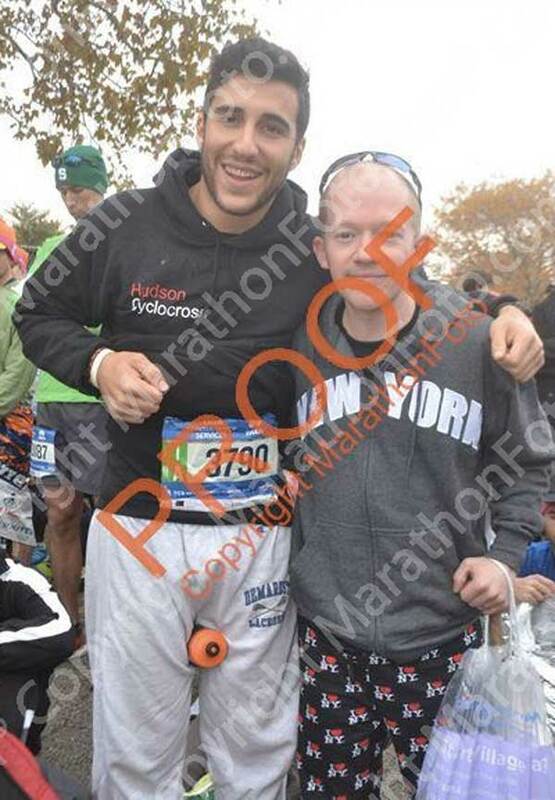 As Evan and I ran we chatted about what he wanted to run on his second marathon. He had run a 3:27 in NJ earlier in the year and just wanted to PR. I asked him what his BQ time would be and he said a 3:05. I nodded my head, “What pace are we hitting?” He laughed as we had just hit a 6:55. We needed to dial it down a bit so I slowed up. I knew I didn’t have a sub3 in me and I didn’t want Even to blow up and ruin his race. 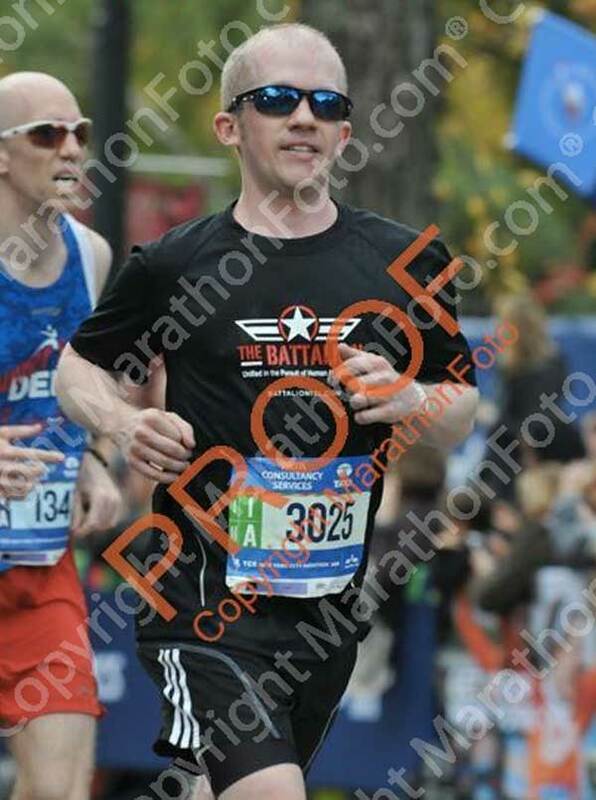 I think at Mile 11 or 12 the 3:05 pace group was right around us and Even looked at me with this huge smile on his face, “Baker, I think I can hang with the 3:05 group! Should I do it? !” He was totally capable at this point and I yelled “Yea man! Do it, go go go!” And with that Evan and the 3:05 group slowly moved out of sight. We hit the nasty Pulaski Bridge, the halfway mark, and the clocks said 1:32. 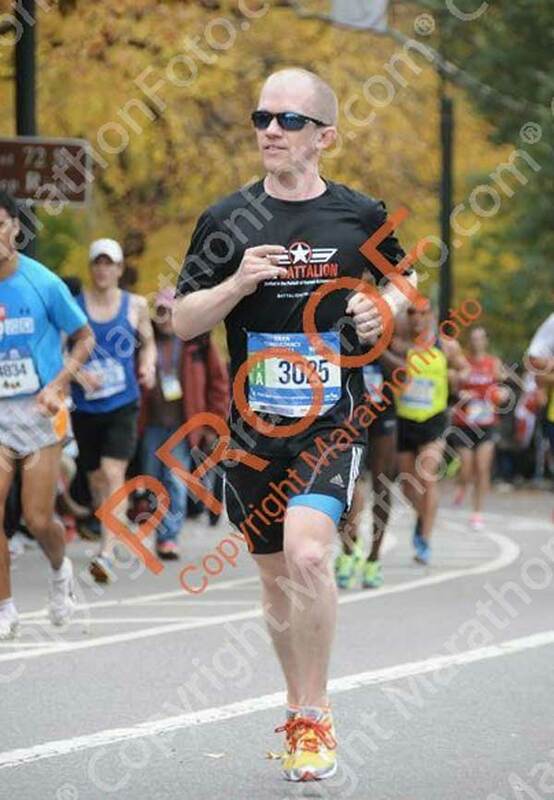 My quads were really hurting bad, the kind of bad that should happen at mile 20. As we made the left into Queens I saw Stephan, Amanda and Vivian cheering followed by Danika, Eric and his brother and finally Brianna! The mighty Queensboro Bridge was fast approaching, a breaking point for many including me. As we turned into the darkness I became overwhelmed with emotion. I was headed home. I saw Dave, Linda, Jordan, Ali, Rachel, Josh, Morgan and many others. It is always hard to keep count on First Avenue. As I approached 96th Street still not feeling great I saw Maura! She was fighting with crowds to get visible. She was holding a banana and screaming “Baker! Do you want a banana?! Take the banana Baker!! !” And so I did, and it saved my race perhaps. I had a few bites and it immediately soothed my stomach and gave me a nice boost. I carried it and ate it all the way through Mile 24. Thanks Maura. I would later find out she was carrying around like 25 bananas, so I am sure she was thrilled when I took one off of her! For the first time in the 5 times I have run this race the Bronx rocked. The DJs were killing it with old school Rap and R&B (a personal favorite). There was also a group banging on these giant drums. It was way cool. We hit the last bridge back into Manhattan and I was feeling pretty good. My legs were on fire, but my head was in the game. At aid stations 22 and 23 I stopped to stretch out my legs for a few seconds, which added some pep to my step. 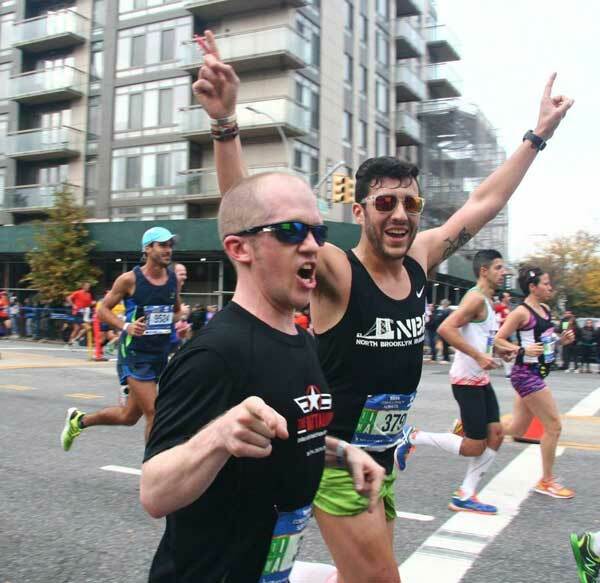 I saw Farrah, Brian and a whole crew of GCR crew cheering along the final miles! Just get to the Park, get to your backyard and bring it on home. Making that turn at Engineer’s Gate was such a happy moment. I was now on home turf with 2 miles to go. The Park has never been so beautiful during the NYCM in my opinion. It radiated gold and red from all the trees changing colors. I gave the Cat on top of Cat Hill a little kiss and wave as I passed by, paying my respects. When you make the right turn on to Central Park South, you have like 3/4s of a mile to go, but that stretch always seems to take forever! It is also a slight uphill which certainly doesn’t help. As we approached Columbus Circle, ready to turn back into the Park for the home stretch I saw Rowland. He was in real bad shape and told me he was cramping bad. I asked if he was okay or needed help and he said no, telling me to go ahead and finish. 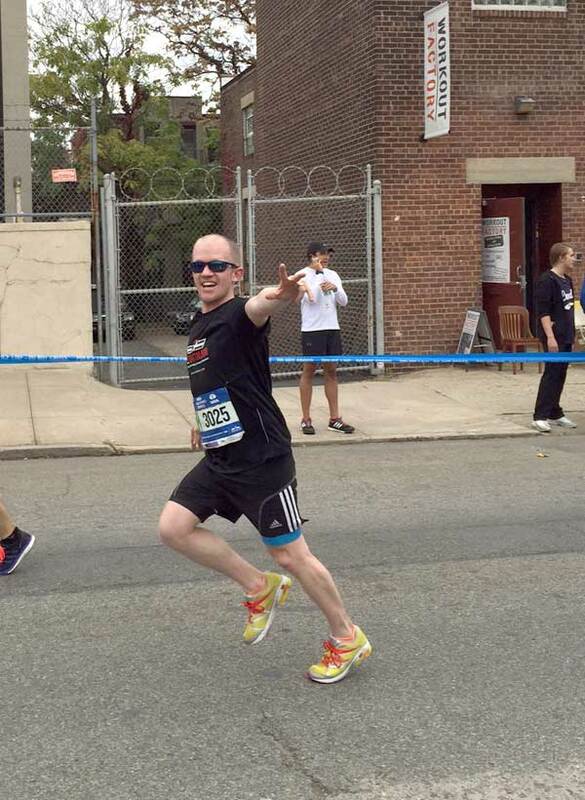 “I will see you at the Finish.” I yelled, barreling forward. Rowland and I having a chat. I tried to get the crowds in the grandstands going as I approached, waving my hands, but it was very calm. 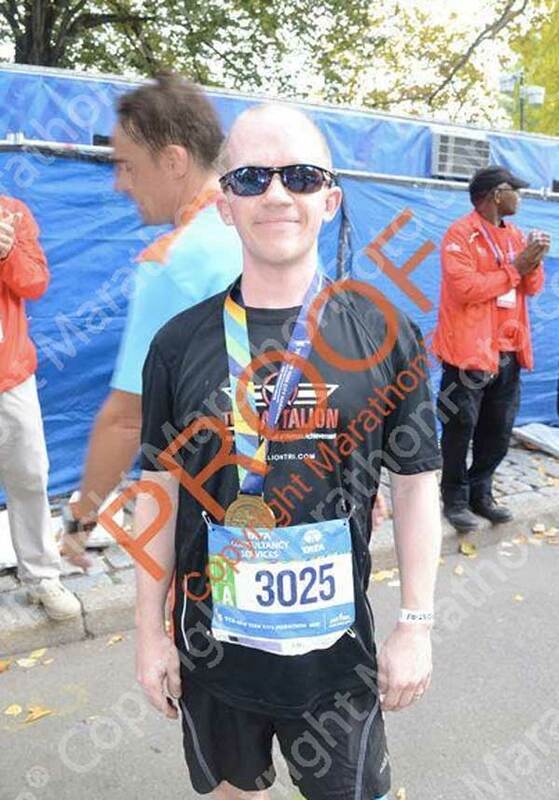 I finished in 3:12:40, not my fastest and not my slowest… right in the middle. After getting my medal and bag-o-food I caught up with Rowland and some of the guys I know. Rowland was smiling now, not happy with his race but physically okay. We all talked about how hot it was out there. It had turned into a beautiful day. 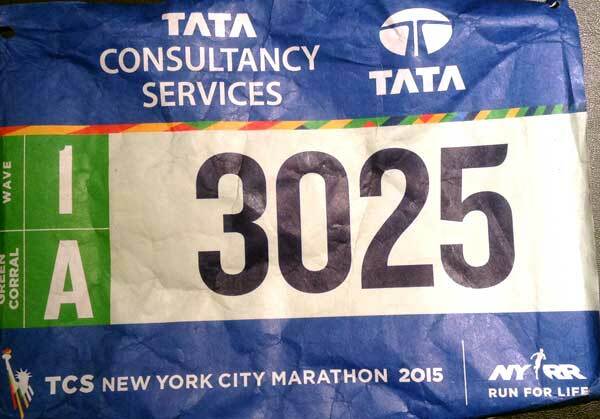 After grabbing my NYCM Poncho I headed north to the 86th Street crosstown bus so it could whisk me through the Park and over to our after party on the east side. I was the only runner on the bus as we sat and waited for the light to turn, then another marathoner entered. It was my brother Jeff! What are the odds? He had a run a 3 minute PR of 3:23! Nice work bro. At The District these two gals were finishing lunch in our reserved section. “No biggie at all,” Jeff and I told our bartender. Then, one of the gals pops up and gives me a big hug! It was my friend Danielle who used to bar tend at Hurricanes on Fire Island (now she tends at Schooners)! Her boyfriend happened to be running the race as well. Slowly our runners and friends started to trickle in. Ali, Rachel, Josh, Morgan and a few others were already there. Then, my neighbor Karen, Dougie, Danika, Dave, Linda, Abbe… Susan and Eric, Kelly, Claire, Thomas, Maura… Farrah, Brian, Justine, Mike… Jim (who had Citibiked from the Finish to The District! )… Cat, Gillian, John, Alamar… Katie, Jordan… and finally Bojana and Brian who had just gotten engaged! I feel like I am forgetting about a dozen people. The night ended with some epic tacos at El Paso. Running isn’t always about making a great time or a huge PR. 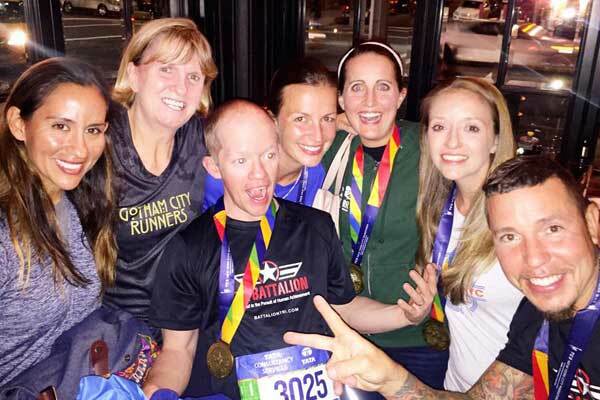 Running is a unique opportunity to bring people from all over the world, from different occupations and varying ages and abilities together. This race closes out the 2015 race season for me. It was one hell of a year, thanks to all of my running and triathlon friends who helped me along the way, making it epic. See you in Boston. Battle Stations!